SOLMATE Solar LED batten light is a pioneering model, when comparing with the normal solar powered tube lights, and is widely used in many applications, such as office, home, garage, caravan, carports, bus stations, warehouses, camping tents, farm tents, sidewalks & alleyways, emergency camps, aid tents, caves, or many kinds of temporary or permanent accommodation structures, etc. 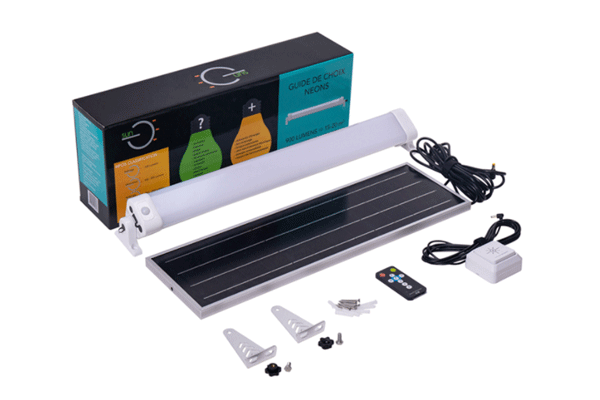 Solar LED batten light is a kit that contains everything - rechargeable lithium battery, solar controller, and solar panel. Easy installation in less than 5 minutes; you just need to plug solar panel into the light by DC connector. It provides a high brightness level over a long period of time, continuous lighting output, and in-built PIR sensor to save power if sunshine is not strong enough. This solar LED batten light also supports working during day time while being charged- under manual operation. By programming the remote control, you can increase or decrease the brightness as you wish; there are 2, 4 and 6 hour settings available. One 5V USB output is included to charge a mobile phone, or similar device. It can be controlled locally or manually rather than centrally or automatic. It is a perfect lighting solution for remote areas, that lack either power or fixed lighting. High efficiency MONO solar panel is adopted with high efficiency up to 21.6%. Lifetime is more than 25 years. Including oxidized brackets in aluminium materials instead of steel.Never get rusted even if after years. all components are inside of box , easy for DIY customers, Good looking color color box for retailer market selling. Cable length from solar panel is 5M with 5.5*2.5 male connector. High temperature resistant, Can working well in -20℃~65℃. Multiple protections with smart BMS built inside guarantee a stable performance. PIR Motion Sensor is adopted in order to save energy. There are two lighting program built in controller, one is 0% power (off)+ 100% power for 1 min, the other is 30% power + 100% power for 1 min. Valid sensitive distance is more than 8 meters. There are many useful functions with this solar lighting kit. It includes one 5V 1A USB output and push button, the most useful function is : A DC port is reserved which is to be extended for wall switch so user can turn ON/OFF the light in the way as for normal light freely. The input port is using 5.5*2.5 female connector. Solar panel can be directly connected easily. Compared with other solar light, a big advantage of this solar light is it can working in day time even if solar panel is charging battery. This is very useful in some conditions for example when solar batten light in installed in wine cellar ,cave, or basement etc where is always full of darkness that sunshine cannot touch. The lighting time and power can be programmed via remote control. Setting operation is easy. 1.What is MONO Solar Panel? The two big technologies in silicon-based solar are still MONO and POLY solar panels. But what is the difference? and how do you know which one is best for you and your solar project? The difference between mono and poly solar panels comes down to the cells that they are made from. The silicon in mono and poly cells undergo different manufacturing processes, making panels with slightly different performance characteristics. Understanding these differences will help you to choose the right panel for your project. Mono crystalline panels (mono-si, mono) are made from silicon that has been ‘grown’ in a single crystal through the ‘Czochralski process’. The crystal is then trimmed, sliced into wafers and treated to form solar cells. Because of the shape of the crystal, mono cells tend to have distinctive ‘cut off corners’.Mono cells are easy to identify by these cut off corners and a smooth even black color. The Mono panels that they make tend to be more efficient than poly panels but also more expensive. This means that if you take a mono panel and a poly panel of the same size and leave them in exactly the same light conditions, the mono panel will generate more power. However, that power will have cost you more per watt because the panel that generated it was more expensive.This trade off in output and cost is often worth it in projects where space is restricted. For example, a home owner with a small roof might choose to use more expensive mono panels in order to squeeze the maximum power from his system in the long run. The solar panel of HELIOS AIT street light is separated from light head. It makes so convenient for customer to choose the right panel according to sunshine radiation of local environments. This is quite necessary especially customers requires 100% power for whole night. For example, HELIOS 20W can come with 40W solar panel if does not need long and brightness for whole light, and also HELIOS 20W can come with 100W solar panel for the area where is lack of sunshine very much, like North of Canada. Comparing with HELIOS AIT. solar panel of AIO is fixed completed on the light, and customers cannot do anything for panel if sunshine is bad, customer cannot increase the panel power as wish. Because of this disadvantages, AIO solar street light always come with a motion sensor, and only work with 30%+100% for whole 12 hours. never support 6 hours 100% brightness+6 hours 100% which is the most requirements for big projects. Thanks to separated solar panel, Customer can adjust the position of solar panel in horizontal and vertical position freely and easily. This allows solar panel can be used with the highest efficiency as possible in the best position. Customer can purchase solar panel from Auroras, or buy from their ready supplier, or use solar panel in stock. More flexible for business. 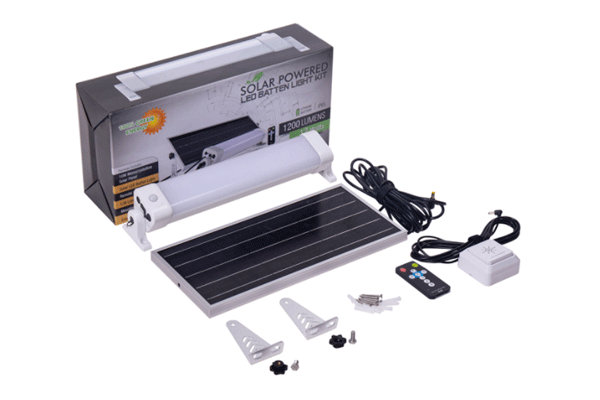 What's more, Solar panel and solar light head are connected by MC4 which is the universal connector for solar panel. Distance from solar panel to light is max 40M. Lights can be installed far away from solar panel. Lighting will be anywhere, anytime.